William Makepeace Thackeray's Vanity Fair depicts the anarchic anti-heroine Beky Sharpe cutting a swathe through the eligible young men of Europe, set against a lucid backdrop of war and international chaos. This Penguin Classics edition is edited with an introduction and notes by John Carey. No one is better equipped in the struggle for wealth and worldly success than the alluring and ruthless Becky Sharp, who defies her impoverished background to clamber up the class ladder. Her sentimental companion Amelia Sedley, however, longs only for the caddish soldier George. As the two heroines make their way through the tawdry glamour of Regency society, battles - military and domestic - are fought, fortunes made and lost. The one steadfast and honourable figure in this corrupt world is William Dobbin, devoted to Amelia, bringing pathos and depth to Thackeray's gloriously satirical epic of love and social adventure. 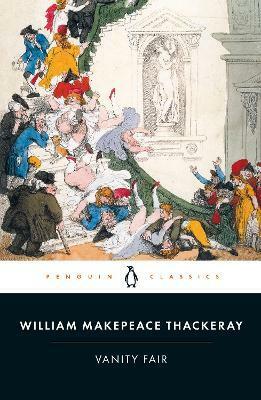 Set against the background of the Napoleonic wars, Thackeray's 'novel without a hero' is a lively satirical journey through English society, exposing greed, snobbery and pretension. This edition follows the text of Thackeray's revised edition of 1853. John Carey's introduction identifies Vanity Fair as a landmark in the development of European Realism, and as a reflection of Thackeray's passionate love for another man's wife. William Makepeace Thackeray (1811-1863) was born and educated to be a gentleman, but gambled away much of his fortune while at Cambridge. He trained as a lawyer before turning to journalism. He was a regular contributor to periodicals and magazines and Vanity Fair was serialised in Punch in 1847-8. If you enjoyed Vanity Fair you might like Guy de Maupassant's Bel-Ami, also available in Penguin Classics. "I do not say there is no character as well drawn in Shakespeare [as D'Artagnan]. I do say there is none that I love so wholly." "The lasting and universal popularity of The Three Musketeers shows that Dumas, by artlessly expressing his own nature in the persons of his heroes, was responding to that craving for action, strength and generosity which is a fact in all periods and all places." --Robert Louis Stevenson "The lasting and universal popularity of The Three Musketeers shows that Dumas, by artlessly expressing his own nature in the persons of his heroes, was responding to that craving for action, strength and generosity which is a fact in all periods and all places." William Makepeace Thackeray (1811-1863) was born and educated to be a gentleman but gambled away much of his fortune while at Cambridge. He trained as a lawyer before turning to journalism. He was a regular contributor to periodicals and magazines and Vanity Fair was serialised in Punch in 1847-8. John Carey is Professor of English at Oxford University. He has written on Dickens and Thackeray.